Hollybeary Creations : Bold & Cheery with Dynamic Duos #82! 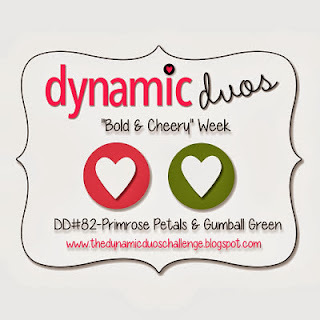 Bold & Cheery with Dynamic Duos #82! 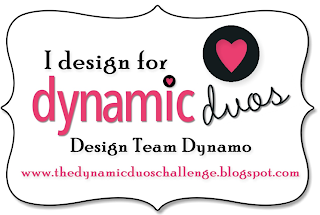 It's Saturday and snowing like crazy outside.. Time for another fun challenge at Dynamic Duos! This week is all about being "Bold & Cheery". We're using Primrose Petals & Gumball Green. I love Gumball green... it's such a bright and fun color! 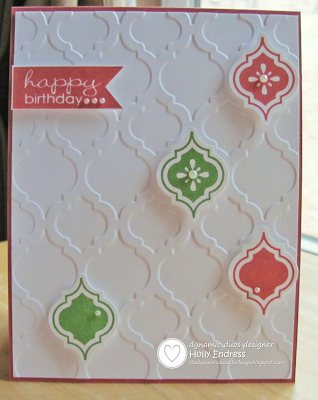 I went clean for a Birthday card.. my card base is Primrose Petals and I added a layer of White that I embossed with the Modern Mosaic folder. I stamped some of the Mosaics' from the Mosaic Madness set in Gumball & Primrose and then I punched them out with the coordinating punch. 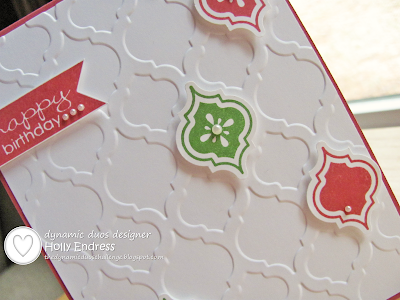 The sentiment is from Banner Greetings a Hostess set you can earn in the current Stampin' Up! Catalog. My project needed a little something extra so I added some small pearls. It came out very cute actually! Be sure to head over to the Dynamic Duos Challenge Blog and see what the rest of the Design Team created this week.. We hope you will join us! The challenge is open until Thursday @ 12pm PST. Sweet, sweet card. Love the colors, Holly. Love your CAS card!! The mosiacs look wonderful in the challenge colors and the embossing folder on the Whisper White sets the stage for one beautiful card! Very classy card, Holly. I like the seemingly random arrangement of the mosaic tiles, and where you placed your pearls. Great eye for design! Nice CAS card! I love the whole Mosaics suite! CAS perfection, Holly. I love the thin border around your embossed white panel. The banner sentiment was a great one to use with the Mosaic Madness stamps- I must remember that for future cards!